Rotary valves and inline venturi systems are commonly used in pneumatic conveying systems. However, these two have major differences. Thus it is used distinguishingly in various applications. 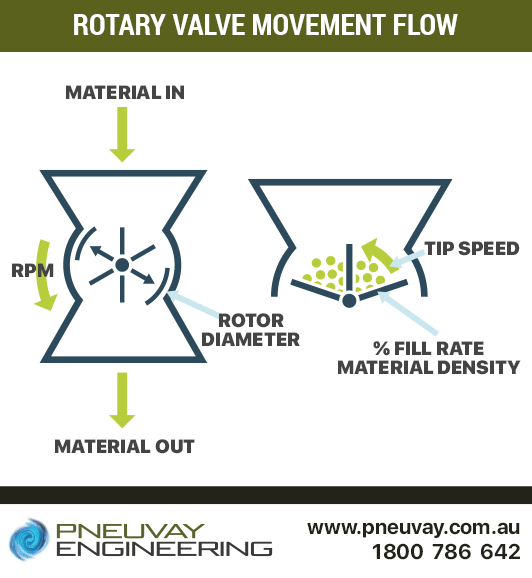 How does a rotary valve work? Rotary valves are placed under silos, hoppers or other container systems. It is used to control bulk solid discharge from these units and feed devices like screw feeders, conveyors and mixers. Rotary valves can also be placed under a cyclone. It applies a pressure seal between the storage and conveying systems so it uniformly flows from the outlet. Dust collection systems also utilises rotary valves to unload dust. It is used to transition material from one pressurised point, such as a dust collector, to another unpressurized point, such as a drum or bin. The valve seals a pressurized system against loss of air and pressure. This makes it to control the flow of material from hoppers, bins, or silos into processing or conveying systems. Rotary valves control the rotor speed of airlock, which allows volumetric measurement to be possible for both powdered and granule type bulk materials. Rotary valves are also used to feed pneumatic conveying lines from hopper, silo, cyclone, and big bag discharge stations. This aids in preventing air leakage from the conveying line while maintaining constant feeding of powders or granules. Rotary valves also aid conveyors feeding from silos, hoppers and screw feeders by sending bulk materials into airlocks before it gets moved into another device. Visit our dedicated page for rotary valves to learn more about it. What is a venturi system? A venturi system is considered as one of the most accurate flow-sensing element, if and only if, it is accurately calibrated. Thus it is important to choose a pneumatic conveying company who has long years of experience in this field. How does a venturi system work? 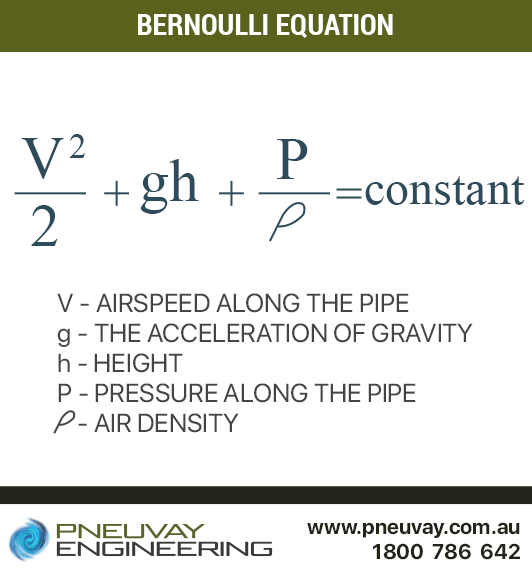 Unlike rotary valves that relies on gravity flow, Venturi systems follow the Bernoulli equation. Under this principle, it states that the sum of all forms of energy in a fluid (including gas) flowing along an enclosed path is the same at any two points in that path. 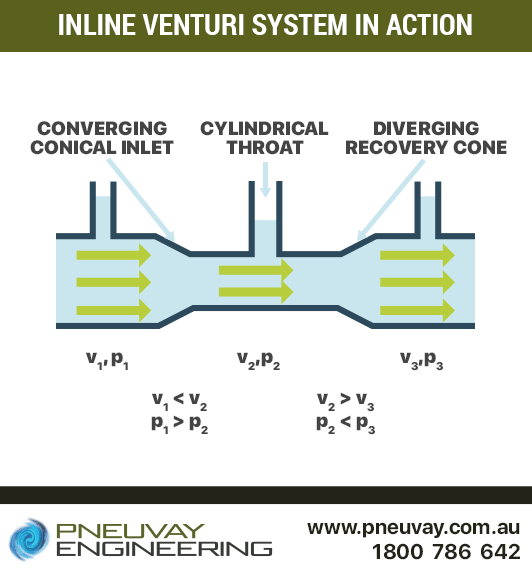 A venturi system speeds the flow of the fluid by constricting it in a cone shape tube. By doing so, it forces the system to have increased velocity application while reducing pressure. This creates a partial vacuum within it. A Venturi system is used in applications that require the removal of gases at a continuous rate while maintaining pressure at a stable level such as removing smoke from a machining or welding area. A Venturi system pumps tank down from a starting pressure to a final lower pressure, which is a requirement often used in the evacuation process. This reduces the pressure in a reaction vessel so it can be purged of detrimental gases. The evacuation process requires pulling gases, with the use of jet pumps, from a defined volume by pumping the tank down from a starting pressure to a final lower pressure. It is often used to reduce the pressure in a reaction vessel to purge it of detrimental gases. Kongskilde has unrivalled expertise in the handling of process waste produced in various industries. This includes the inline venturi system. 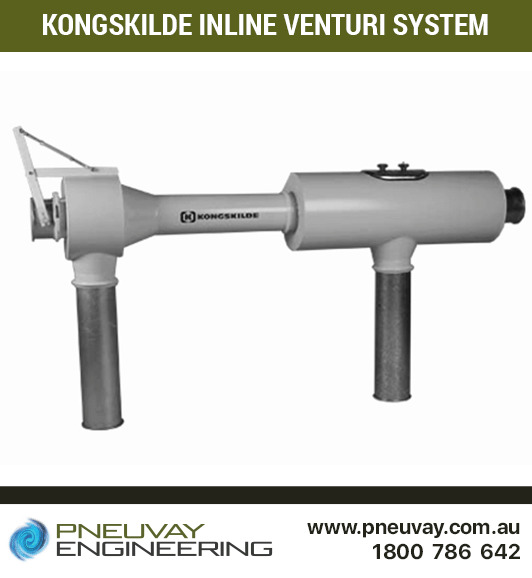 Why choose the Kongskilde Inline Venturi System? We now come to the big question: what system should I use for my pneumatic conveying system? A pneumatic conveying system that requires suction and varying pressure applications within the pipeline is better off with a venturi system. However, for industries requiring the continuous charging of bulk powders such as the following, it may be better to use rotary valves. Do you need help figuring out the best system to use for your factories and plants? We are happy to help you. Contact us online so we can schedule an appointment with you.